Firefighters from the Coppell Fire Department help contain a brush fire around the property of Mount Pleasant Missionary Baptist Church in Cedar Creek, Texas. 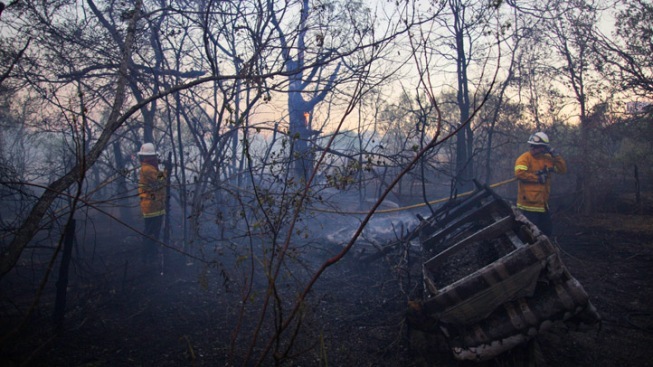 The wildfires in central Texas have since burned 25,000 acres in Bastrop County alone. A lawyer for three victims of this month's Bastrop County wildfire is suing an electric utility whose fallen power lines officials say likely started one of the most destructive wildfires in recent Texas history. Attorney William Rossick filed the suit Monday in Bastrop against Bluebonnet Electric Cooperative. The suit seeks compensation for personal injury, property damage, mental anguish and medical expenses. Texas Forest Service officials say tree limbs pushed by 30 mph wind gusts over the Labor Day weekend likely struck Bluebonnet's overhead power lines, sparking the fires that destroyed 1,554 Central Texas homes and killed two people. Bluebonnet CEO Mark Rose tells the Austin American-Statesman the suit is a misguided attempt to blame the utility for a terrible incident that was out of its control.